For many of our readers, it’s cold outside, and it feels like the cold will never go away. Like, EVER. To battle the cold, we propose hosting an indoor luau. 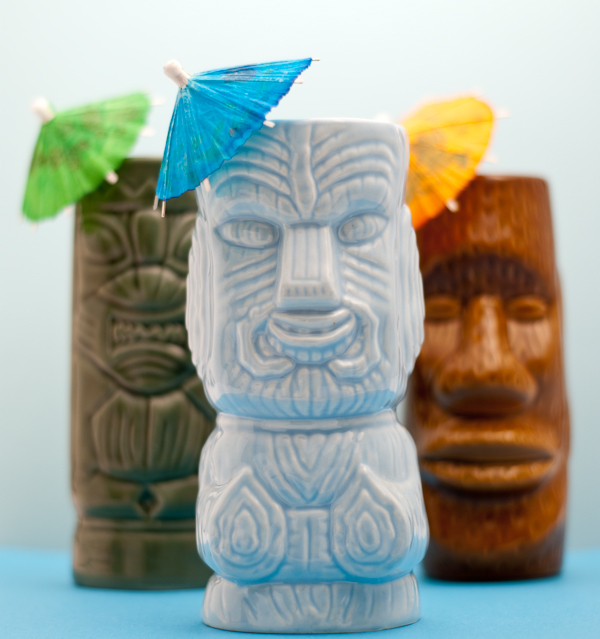 Crank up the heat, dust off the Tiki glasses and paper umbrellas, and say “Aloha!” to fun. While our dishes might not be the most authentic of luau fare, they’re easy to make and contain ingredients that can be found in most supermarkets. First, a fabulous Tiki drink from Shag’s Tiki Drinks Deck. It’s a set of 52 cards, each with a different drink recipe. One of our favorites is the Aloha Screwdriver. To make it a virgin drink, just omit the alcohol and add a bit more juice. Blend 1 oz. vodka, ½ oz. coconut rum, 2 oz. orange juice, 2 oz. pineapple juice and 3 oz. ice until smooth. Pour into a glass and garnish with maraschino cherries and or/a pineapple wedge. If you’re omitting the alcohol, you can double the recipe for an extra punch of Vitamin C, which can only help our immune systems during cold and flu season. It wouldn’t be a luau without fresh pineapple. Can’t find a whole pineapple in the grocery store? Canned and frozen pineapple chunks are also great, and offer fiber and Vitamin C. The canning and freezing process retains nutrients, as produce is processed at its freshest. Look for canned pineapple in its own juice as opposed to light or heavy syrup. Try combining pineapple with other fruits for a delicious fruit salad or make a Hawaiian pizza by topping it with pineapple chunks and pieces of ham. The Produce for Better Health Foundation offers a recipe for a zesty pineapple salsa. Another island treat is coconut. While a whole coconut might be even more challenging to find fresh than a pineapple, it’s fun to make dishes such as coconut flan or coconut sweets. A deliciously sweet treat, coconut is rich, and flavorful, but unfortunately high in calories and saturated fat. On the positive side, it offers fiber, potassium and even some iron. If that helps justify indulging in macaroons or flan, do enjoy! What would you serve at your indoor luau? If you throw a party, please e-mail us the photo, and we’ll blog it and give you credit for the shot! How Stacey Got the Shot: In lighting class on a Plexiglas table. Photoflood lamp on the bottom, a flood lamp on a boom on top of the setup, with diffusion material in between. Reflectors on either side of the subject. ISO 100, focal length 50mm, f/2, 1/60 second exposure. "photo flood on boom above"
Coconut flan, what a brilliant idea! My cousins are all weirdly into cooking with coconut oil; it’s some new “health” craze. See also, the cider vinegar diet. I wonder if there’s anything to it, though.